CAPC sat down this month to talk about pediatric palliative care with Peggy Maguire, President and Board Chair of the Cambia Health Foundation, and Kathy Perko, MS, CPNP, Program Director of the Bridges Palliative Care Program at OHSU Doernbecher Children’s Hospital. This post builds upon a pediatric palliative care white paper recently published by the Cambia Health Foundation. CAPC: What sparked the interest that led each of you to make pediatric palliative care a part of your career? Kathy Perko: Seventeen years ago I had just started at OHSU Doernbecher. I was working full time in pediatric oncology with a specialty in neuro-oncology at the time, and a group of parents came back and told the staff that we could have done a better job taking care of their children. They weren’t talking about the physical care that was being provided to these kids, but about the missed connections that happened at the end of life. Over a period of years during the treatment course, an entire team of physicians, nurses, child life specialists, social workers, and chaplains cared for these kids and their families. When they went home to community hospice providers in the Portland area at the end of life, this team of people who had been so important to them were suddenly missing from their care experience. With the support of our Department Chair of Pediatrics we connected an interdisciplinary group of people to examine how we might do things differently. We started by looking at our community hospice partners and our parents. When patients went home on hospice, we made a commitment to check in with both parents and hospice nurses at least once a week. In so doing, we realized that the hospice nurses actually had questions about how to take care of pediatric patients—which tells you how different pediatric palliative and hospice care can be from working with adults. We grew the program from that starting place, and one of the things that was most helpful to us was having support from Regence (as the Foundation was known at that time) that allowed us to buy a little bit of my time, a little bit of a social worker’s time, and a little bit of a physician’s time. It wasn’t much in the beginning, but we took that back to the Department Chair and the director of the hospital to show them that our community hospice partner had already become supportive of what we were doing. Our hospital administrators knew that the program would be strongest if it responded to a need we were hearing from the community. Kathy Perko checks in with her patient, Michael Wilson. Peggy Maguire: When the Foundation was established as a separate 501(c)3 from Cambia Health Solutions, our corporate parent, we wanted to focus our dollars on areas in health care that were aligned with our company cause of being a catalyst for more person-focused and economically sustainable health systems. We asked ourselves, “What could really transform the way that people experience healthcare?” Several of our leaders have had personal experience coping with serious illness, including a leader who lost a child to leukemia. We talked about the difference that we observed in families who had received good palliative care and those who had not. Especially when it came to pediatric palliative care, we recognized that quality palliative care has an impact not only on the patient, but on all members of the family—how they experience care and grief and growth. That’s what led us to create Sojourns as the signature program of our foundation. CAPC: You both described how meeting an unmet community need sparked action, and how pediatrics is in many ways leading the field in terms of making palliative care the standard of care for all families. Can you talk about the differences between caring for infants and children—pediatric palliative care—and caring for seriously ill adults? Kathy Perko: Palliative care is not a one-time interaction with people—by definition it’s a relationship. In pediatric palliative care we may take care of kids from infancy into adulthood, and so we recognize that conversations with grown-ups can happen more efficiently than they can with kids. If someone told me today that my father has a terminal illness, I would recognize what ‘terminal illness’ means and could start to think about the future. That is not always the case working with children. In pediatric palliative care we also have siblings—a three year old with serious illness may also have an eight year old brother and a 15-month old sister. The way that all of those children look at what serious illness and death are is very different. In pediatric palliative care, our expertise has to cover adult medical understanding of serious illness and also the understanding of kids. Palliative care is not a one-time interaction with people—by definition it’s a relationship. Depending on how programs work, sometimes you’re first meeting with families in a moment of crisis—but most pediatric colleagues I talk to will start any conversation with, “Tell me about Michael. Tell me about your son. Who is this child for you? Who are they in your family?” We do that to remind families that Michael is not a 26-week baby born extremely prematurely with head bleeds and a cardiac condition—Michael is their much-wanted and hoped-for son. By stopping for a moment to reflect on this, that allows us to learn a little bit more about the family before we start having those difficult conversations. In pediatrics we also are lucky to have concurrent care, which allows patients and families to get both disease treatment and palliative and hospice care at the same time if they have Medicaid. That isn’t always supported by private insurance plans, but many of my colleagues and I are able to work with insurers and medical institutions to allow parents and families to have both. This makes a huge difference for families—you’re not asking a parent to choose between an experimental chemotherapy agent and hospice care for their child. Unfortunately, this is very different in the world of adult palliative care. What we try to do more and more in pediatric palliative care is to introduce our services as early as we think is appropriate. For example, Bridges has a very robust fetal program in which we meet all families whose babies have complex congenital heart disease. Some of these babies do quite well, but some do not do well, and all of these babies have a series of surgeries and time in the neonatal and pediatric ICUs. We meet all of those families when the mom is pregnant to provide an extra layer of support—a consistent person from prenatal diagnosis through the first month or even year of their child’s life. CAPC: How have the Bridges program and Cambia Health Foundation worked together over the years? Peggy Maguire: We have had a long and happy relationship. The very first grant from the Cambia Health Foundation was to Oregon Health & Science University (OHSU) – Doernbecher Children’s Hospital Foundation in 2004, to help bolster their Bridges pediatric palliative care program. We made an initial investment of $150K over three years to support the development and growth of the program. We also made a $50K grant in November of 2009 to support hospice education in Idaho and Oregon. In February 2012, we made another grant of $195K to allow the Bridges team to leverage telehealth as a means of sharing their specialized knowledge about pediatric palliative care with adult hospice workers in rural communities. Our ultimate goal was to support children and families in those communities. In July 2012, we recognized Kathy Perko with a Sojourns Award for excellence in pediatric palliative care and for her leadership of the Bridges program, and later that year we invested $250K in a mental health project that supported the ability of the Bridges team to hire a social worker and a chaplain. 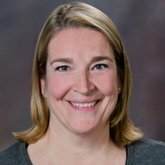 Given our experience with the program and our confidence in the Bridges Team, we invested $4M as part of the Knight Cancer Challenge to establish an endowed pediatric palliative care Chair at OHSU Doernbecher and to support the creation of an Innovation Fund in pediatric palliative care. Our commitment to palliative care dates back to the inception of the Foundation, and our long-term relationship with Kathy Perko and the Bridges Team at OHSU/Doernbecher has helped us to achieve a better understanding of the differences between adult palliative care and pediatric palliative care, and how we as a foundation can impact growth. 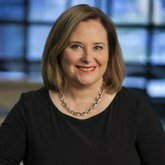 CAPC: Kathy, what has the Foundation’s involvement at these critical growth moments meant for Bridges, and how has that been received internally by your hospital leadership? Kathy Perko: It’s been transformative. There has been an ongoing relationship between our organizations that allowed us to explore with the Foundation: “This is where we are now, this is where we could be going, and is there an opportunity for us to partner?” For example, we knew that one of the things that many of our families wanted most was to be able to bring their child home. What we needed to make that happen was a strong partnership between our pediatric palliative care experts in the hospital, and the community hospice workers who were committed to learning more about pediatric palliative care in order to support patients and families at home. Our Physician in Chief, the Foundation, and the Bridges program met together to envision what the telehealth program would look like and talked with our community partners to ask how we could be more responsive to what families want. Because we had our Physician in Chief at the table with us, he was able to hear from our team and from Cambia about what patients and families want and ask for. With buy-in from our administration and support from the Cambia Health Foundation, our Bridges program developed a telehealth initiative. Our program uses iPads that stay with the hospice nurse—not the family—because we believed that high-tech needs to mean high-touch. If we’re going to connect with families through an iPad and potentially have difficult conversations, we want the hospice nurses to be there sitting by the side of that family so that they can continue to answer questions once the call is over. For example, a little boy on our telehealth program was on hospice for a bit over five years being supported by his community hospice and the Bridges team. We connected with his family during this time via telehealth—sometimes with his neurologist, sometimes with one of his favorite nurses and his siblings—which allowed his family to avoid readmitting him to the hospital. The hospital appreciated this, and more importantly, it allowed this little boy and his family to stay at home in their community. When he did die, his community was right there and could continue to support his family. CAPC: How has the relationship between Cambia Health Foundation and Doernbecher Children’s Hospital shaped the foundation’s pediatric palliative care strategy? Peggy Maguire: As a foundation, we try to exercise humility and listen to the evolving needs in the field in order to figure out where we can have the most impact. Before we created the Sojourns Scholar Award, we had the Sojourns Award, which recognized existing leaders and people such as Kathy who were making a significant impact on the field of palliative care. Our Sojourns Scholars program was then launched in 2014 to support the work of emerging leaders and invest in their skill development. To advance the field of pediatric palliative care and its leaders, we have invested in four different Scholars projects that have a pediatric focus. Dr. Jennifer Walter at the Children’s Hospital of Philadelphia is focusing on improving goals of care conversations in the pediatric cardiac intensive care unit. Debbie Lafond, a nurse practitioner at Children’s National, is developing competence in caring for children with life-threatening illness through the Pediatric Advanced Needs Assessment (PANDA) Care Team. Debra Lotstein at Children’s Hospital Los Angeles studies how to maximize the use of home-based care for children with serious illness. Dr. Renee Boss at John’s Hopkins, who specializes in neonatology and neonatal palliative care, has the ‘Big Picture Project’. All of these projects are designed to advance the field of pediatric palliative care to improve care quality for all seriously ill infants and children while also developing leaders in the field. Each of the Scholars receives a two-year, $180K grant that allows them to work on an innovative project that will advance the field while also developing their own leadership skills. We pair each Scholar with a mentor, and they also participate in a cohort of learners that becomes a supportive leadership community. We are entering the fifth year of the program, and we’re now planning affinity groups in which we will mix Scholars from different cohorts. Pediatric palliative care is one of those unique areas where our Scholars can learn and grow together—and move the field together. We’re constantly in learning mode, listening to the experts in the field and what they need to care for children and families. 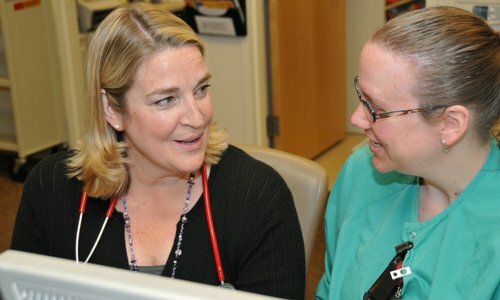 Kathy Perko and RN Angela Stoll discuss plans for patient care coordination. 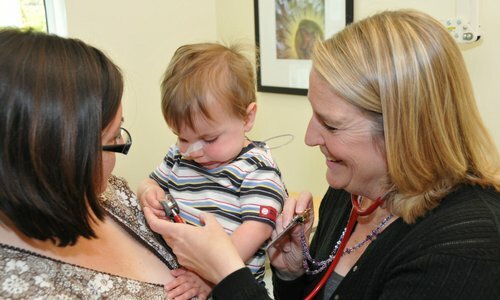 CAPC: You have both in your respective roles been pioneers in pediatric palliative care. In your opinions, what is needed next in order to accelerate change in the field? Kathy Perko: Continuing to engage philanthropic partners, hospital administrators, clinicians—anyone that cares for a child in the hospital, which is often where pediatric palliative care starts. This means our neonatal ICUs, our pediatric ICUs, genetics clinics, and metabolic clinics where children and families are getting diagnoses of complex chronic or serious illness. The other piece is community engagement. One of the reasons that our program has been successful in meeting families’ needs—often that they want to be cared for at home—is by working with community partners. We’ve committed to educating those community partners—not just hospice nurses and social workers and chaplains, but schoolteachers and Girl Scout leaders and coaches—about what it means for a seriously ill child to go home from the hospital to their community. Children often want to be at home, and parents do too—but they’re afraid they can’t do this work or that they don’t have support in their community. One of the things our program is most proud of is that when a family tells us they want to go home when their child is at the end of life, they can go home—throughout all of rural Oregon and southwest Washington and into Idaho. That takes the commitment of our community hospice partners, and when it happens our team gets bigger. If a child has a complex cardiac disease and it’s not something I have expertise with, then we reach out to our cardiologists and they become part of this team as well, to allow that child and family to have the care and support they want at the end of life. Peggy Maguire: Dr. Diane Meier [Director, Center to Advance Palliative Care] says that ‘Palliative Care Everywhere’ is the goal. It’s being able to increase access to palliative care services in whatever setting makes sense for the patient and family—whether it’s the hospital or the community. To make that happen would be a huge step forward. – Learn more about the Cambia Health Foundation Sojourn Scholars program. – For a catalog of field resources, tools, and training for pediatric palliative care innovation and growth, download the CAPC Pediatric Palliative Care Field Guide. Based in Portland, Oregon, Cambia Health Foundation is the corporate foundation of Cambia Health Solutions, a total health solutions company dedicated to transforming the way people experience health care. Founded in 2007, Cambia Health Foundation awards grants in three program areas: Sojourns (palliative care workforce and leadership development, quality, access, and awareness); Transforming Health Care; and Children’s Behavioral Health. The foundation has funded over $51 million in grants to advance patient- and family-centered care for all. Learn more at cambiahealthfoundation.org, and follow them on Twitter: @CambiaHealthFdn. The Doernbecher Children’s Hospital Bridges Program provides comprehensive pediatric palliative care services for children facing serious illness and their families. Launched in 2003, the interdisciplinary Bridges team works closely with Doernbecher’s Child Life program, nutritionists, occupational, and physical therapists to ensure that children and families’ physical, emotional, social, and spiritual needs are met at all stages of care. Learn more about the program.